Telecanter's Receding Rules: Secret Santicore! I think it would work better if the two wheels could spin independently, but I ran out of time. Happy Holidays and Merry Christmas! Oooh, I can so use this. 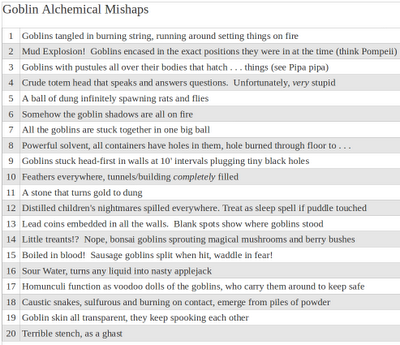 I have some alchemist using goblins in a castle near where my players are. If they go there, I'll be using this :) Thanks for sharing. You could print it on cardboard twice and make the inner ring and the goblin spin around a pin, I think. Oh, of course, just print it three times, goblin up on the first level, inner ring (and goblin, but not to be seen on the second and the whole thing as base. D'oh! Could affect the dice rolls on the edges, though. Too cool! I like drop charts like this. 6 and 11 made me laugh out loud. So worth it: thank you. 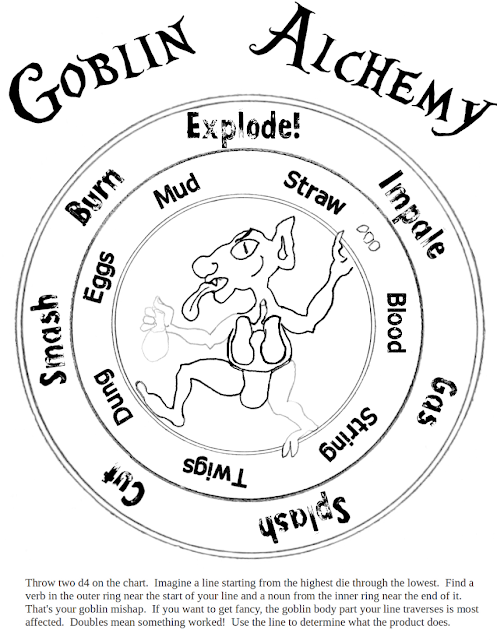 @Simon: I'm glad, I imagine it could be quite amusing to encounter some of these (ball-o-goblins). @rorschachhamster: Duh, of course, printing and cutting! I should have thought of that, thanks. I think it's ok if the little guy spins around so two printings would do. Just cut out the inner circle and use a paper clip to hold it on. Here's a party-gameish idea: you get to twist it for the next person to roll, to either a) try and make it a tough one for them to interpret (impaled by eggs!?) 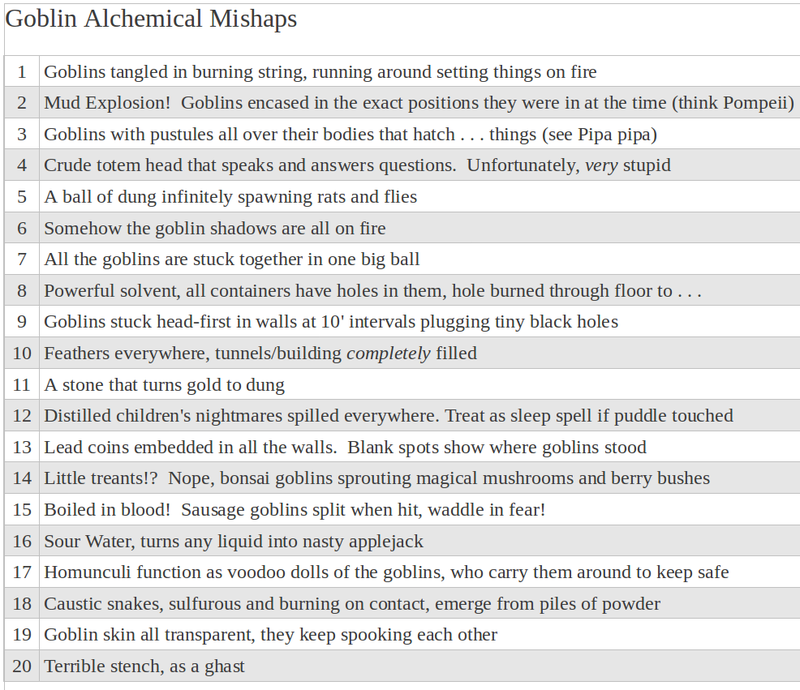 or b) you're all playing goblin alchemists and want to screw each other. @richard: 6 surprised me. If I were to do another draft of the table (maybe after more real play) I would want more entries with that tone to them-- fantastic but could play spooky or kooky depending on the way the DM takes it.